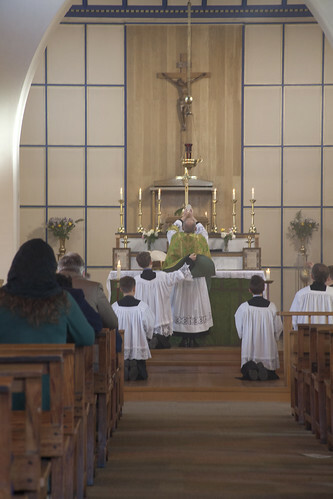 On Sunday I was at Our Lady of the Rosary, Blackfen, for Fr Tim Finigan's regular Sunday Sung EF Mass, which was followed by a Vetus Ordo Baptism, and blessing of the mother 'after childbirth', 'churching'. Fr Tim has posted about it too. 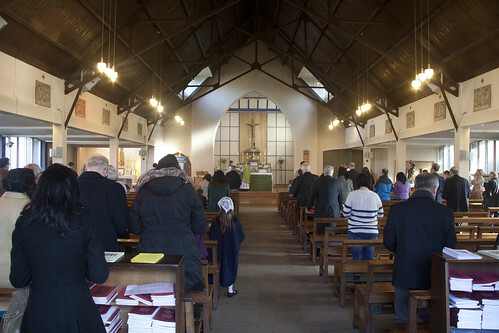 Our Lady of the Rosary is still one of a very small number of places where there is a Sung Mass every Sunday. The FSSP in Reading, the Institute in New Brighton in the Wirral, St Bede's, Clapham Park, and the Birmingham Oraotry are I think the only other places in England and Wales. Only in these places will you see the Asperges (top photo) every Sunday, the blessing of the congregation with holy water before Mass starts; this is only done on Sundays. Below, the catechumen is being anointed with chrism; he is held by his godmother. 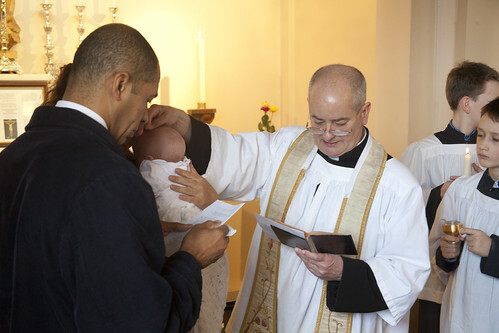 The traditional Baptism places the godparents at the centre of the ceremony, they are not just witnessing it, but make the candidate's responses. What do you seek from the Church of God? Faith! What does Faith offer you? Eternal life! 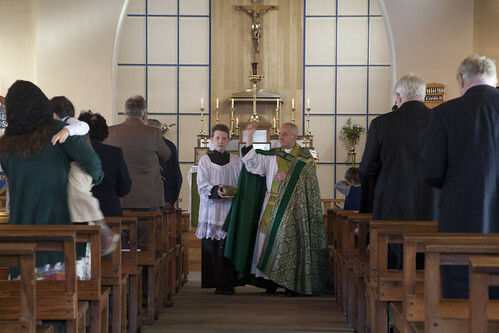 The mother's blessing, like the child's baptism, starts at the church door and draws her inwards, in this case to the communion rails where she is sprinkled with holy water. 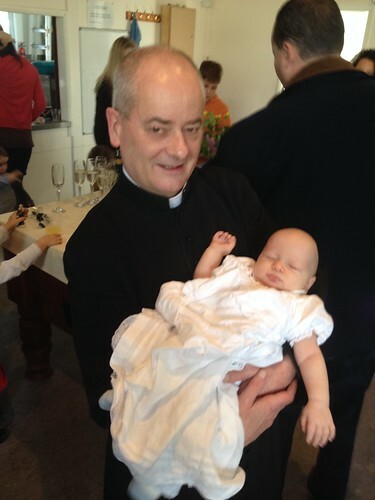 Fr Finigan has a cunning brass device for doing this, which you can see in this picture. A little celebration afterwards in Our Lady of Rosary's substantial parish hall and bar. 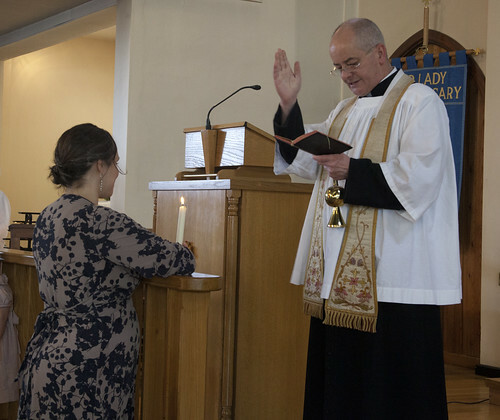 Thou who through holy baptism hast granted Thy servant remission of sin and newness of life, cause the light of Thy countenance, Lord, to shine ever in his heart. Keep the shield of his faith unscathed against every assault of his foes; keep clean and unblemished the garment of incorruption that he has put on; by Thy favour keep unbroken upon him the seal of the Holy Ghost; and as Thou art rich in mercy, deal gently with him and with us. Amen. And such a peaceful one! Oops! Quite right, correction made. And it is splendid! Solemn Mass every week. That is unique. The Shrine of St. Augustine, Ramsgate, noon EF mass, every Sunday (bar a summer holiday).